It’s been Samsung’s long-running strategy to saturate the market with mobile products, making the Galaxy brand name a household name. Known for sometimes over-the-top and ridiculous ad campaigns, there’s little chance you’re not aware of the company’s smartphone and tablet offerings. When it comes to the tablet space, Samsung already offers the Tab and Note lineups, each with its own respective and more powerful “Pro” version. And now the Tab S adds another tablet family to the Samsung mix. With so many tablet offerings already, it all may seem pretty hazy, but Samsung has just announced its best tablets yet, the Galaxy Tab S 8.4 and 10.5. They feature Super AMOLED displays with incredibly high resolutions, and both are extremely thin and light with top-notch specs across the board. With the Tab S line, Samsung reminds us of its end game: Take down the incredibly popular Apple iPad. There’s a lot going on with the Tab S, and after a quick read of the spec sheet, it’s easy to see that Samsung has its sights on perfection. While you’ll still find some of the company’s standard features and unfortunately plastic build materials, the entire package is more well-thought-out than some of its other products. With the exception of the battery capacity and screen size, the 8.4 and 10.5 inch versions of the Tab S are nearly identical. The Wi-Fi only units I received each share an Exynos 5 Octa processor, though LTE variants will ship with Qualcomm Snapdragon 800 processors. The Tab S also comes with 3GB of RAM, 16 or 32GB of internal storage, a micro SD card slot, IR blaster, 8-megapixel rear camera, and a 2.1-megapixel front-facing camera. On the face of both tablets are the usual suspects: Above the displays you’ll find front-facing cameras and ambient light sensors, and below you'll see the same button layout found on the Galaxy S5. Like the company’s flagship smartphone, the Tab S line also shares a built-in fingerprint scanner in the home button to unlock the tablet. It can be used to log into multiple user accounts. Because of the size differences between the two models, the power button, volume rocker, speakers, IR blaster, and Micro SD card slot are placed on different sides to accommodate the orientation each was designed for. The 8.4 inch Tab S is designed with portrait orientation in mind, where the 10.5 is meant to be used in landscape view, with the navigation button setup reflecting this. With the exception of a few tweaks, the 8.4-inch model essentially performs like larger Galaxy S5, only much prettier. The back of the tablets also share a similar setup, housing only the 8-megapixel camera with LED flash, and a feature from Samsung that has yet to grace any of its products before: docking locks for covers. Overall, it looks as though Samsung left no stone unturned in terms of hardware features. While most of Samsung's smartphones ship with Samsung's own, home-made AMOLED displays, the company has only offered a single tablet with one, the Galaxy Tab 7.7. A solid offering for its time—but ultimately doomed by an expensive price tag and the miserable Android 3.0 Honeycomb—the Tab 7.7 was easily forgotten. 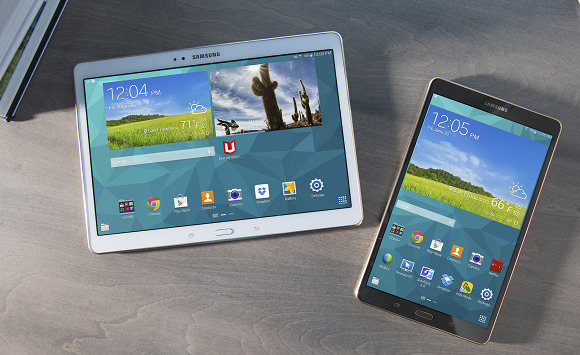 With the Tab S, however, the great screens that adorn Samsung’s smartphones are available once again in tablet form. While the screen on the Tab S looks stunning, it’s something that only enthusiasts will likely seek out. AMOLED displays are bright and offer deep blacks, though you’ll find that the colors usually look over-saturated throughout. Whether you like this approach is up to personal preference, and the Tab S display is nothing out of the ordinary compared to previous Samsung products. Personally, I like a touch of over-saturation, especially when viewing already vivid colors. Samsung says that its displays offer more than 90 percent of the Adobe RGB color space, where LCD displays cover around 70 percent. The company is clearly proud of its display technology, and is quick to knock others. With display resolutions of 2560x1600, slightly higher than the iPad Air, text and images on the Tab S tablets are ultra crisp. Given that both tablets share the same resolution, this gives the 8.4-inch Tab S a higher PPI (pixels per inch) spec of 359, as opposed to the 287 PPI found on the 10.5-inch model. 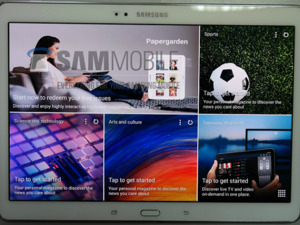 Still not intrigued by the fantastic screen on Samsung's latest tablets? DisplayMate has dubbed Tab S to have the best performing tablet display that it's ever tested. Now Samsung holds the crown for best smartphone display and tablet display on the market right now, according to DisplayMate, which is nothing to scoff at. Just because the display on the Tab S is ultra vibrant and bright, that doesn't mean you’ll always want it to be. Luckily, Samsung has a few tricks of its own to help you adjust the brightness and tone of the gorgeous screen, and I'm not just talking about tapping on Auto-brightness. No matter what content you’re viewing, the Tab S will have a setting for it. Whether you’re reading an e-book from Google Play Books, watching a movie, or just surfing the Internet, Samsung's Adaptive Display will adjust itself for the best viewing experience. 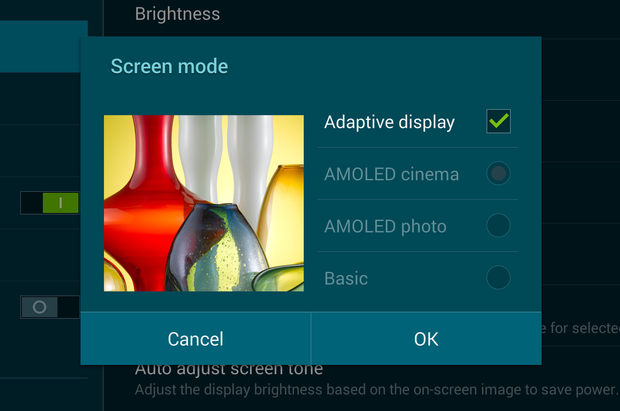 While Adaptive Display is currently limited to only seven applications, Samsung provides three Screen Modes that work for all apps: Photo, Cinema, and Basic. Each provides “optimal tone and brightness” for the type of content you’re viewing. Another small but nice addition is a setting that will auto-adjust screen tone based on the image that’s currently being displayed to save power. The screen mode options are indeed nice features, but I’m willing to bet that most users will rely on the Adaptive Display option when it's supported apps, and manually adjust brightness in others. You don't want to change display settings every time you open a different app. The Tab S tablets offer more than just fantastic displays on average tablets. Samsung went out of its way to make sure it takes "thin and light" to a whole new level, too. Both tablets have an incredibly thin profile of 6.6mm, which is thinner than most smartphones today. The AMOLED display also helps to achieve this, as it doesn’t need the backlight that LCD panels do. To match its thin profile, the new tablets are also very light. With the larger Tab S weighing only 465 grams, it’s hard to believe you’re holding a tablet with a 10.5-inch screen. As for the 8.4-inch Tab S, it’s 294 gram weight is almost the same (only 4 grams off) as two Galaxy S5s. Incidentally, it's also 4 grams off from the 7-inch Nexus 7. Both tablets are thinner and lighter than the iPad Air and iPad Mini, though the difference is negligible. Still, Samsung’s use of plastics allow the Tab S to have larger screens while still remaining lighter than the competition. The Tab S design doesn’t deviate much from the aesthetic of the Galaxy S5, but Samsung introduced a few changes to provide a more premium look and feel. The same perforated plastic of the S5 adorns the back of the Tab S and provides decent grip, but this is still plastic we’re dealing with. Don’t expect it to feel like precious metal when you hold it. Colors are limited to Titanium Bronze and Shimmering White, and on both themes, the edges are lined in a copper metal finish. The end result really does make the tablets look like premium devices and not run-of-the-mill, cheap-looking Samsung hardware. The accented edges don’t necessarily make you think that you’re holding a premium product, but visually, it’s a really nice touch. I’m a pretty big fan of the bronze color, on which the copper accents along the edges are played down and don't have the stark contrast you see on the white model. The dark option also gives off a refined, timeless look. Samsung could create a tablet with the best specs the world has ever seen, but that may not mean a lot to the average consumer. So, instead of trying to woo Joe Schmo with hardware alone, Samsung has struck deals with content providers for the Tab S. From a free 3-month subscription to Marvel Unlimited to a year’s worth of Bloomberg BusinessWeek, buying a Tab S gives you a wealth of content. Looking for a good magazine to read? Head over to Samsung’s Paper Garden app and you’ll find some of Condé Nast’s best offerings. GQ, Vogue, Vanity Fair, and other popular magazines, all of which look great on the high-resolution display. If you just want to curl up with a good e-book, Samsung has you covered here, too. Kindle for Samsung is a customized app for the Tab S, and not only brings you the massive e-book store from Amazon, but also one free e-book a month via Samsung Book Deals. You’d almost think that Samsung would run out of things to give away to its customers, right? Wrong. While it’s hardly the last of the many Samsung Gifts, the company is also giving away the movie Gravity for free. Spoiler: All those dark space shots look great on the AMOLED display. The software experience on the Tab S line isn’t going to surprise anyone. The custom interface on Samsung’s latest tablets is a tweaked TouchWiz, focusing on a magazine-like experience designed with larger screens in mind. The software looks very similar to that of the Tab Pro lineup, which isn’t a bad thing, as it looks nice. The software is hardly perfect, and can lag a bit from time to time, though not often. Given the heavy customization of the user interface, the 3GB RAM will likely be put to good use. It's worth noting the Tab S doesn’t support stylus input. This remains exclusive to the Note line. Who knows, if we wait a month, maybe Samsung will release a Galaxy Note Pro S 10.1, or something with a catchy name like that. What's one more tablet? Overall, Samsung’s Tab S software is pretty much your standard faire, but comes with a few apps and features that could define the experience for you. 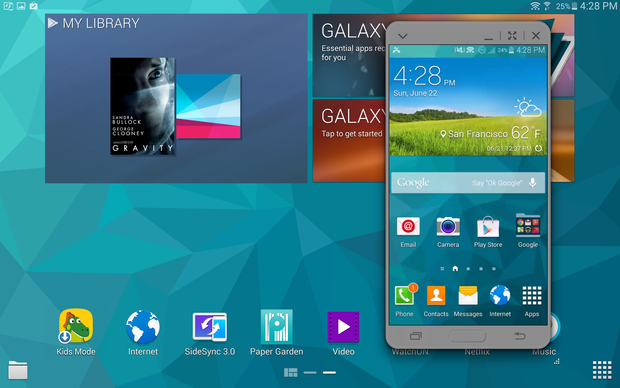 Samsung has a nifty bit of software for PCs and Macs called SideSync. It allows you to see an image of your phone on your PC's display; share your mouse and keyboard; and drag and drop files. With the Tab S, Samsung extends this function to tablets, allowing you to see and operate your Galaxy S5 right on your Tab S display. 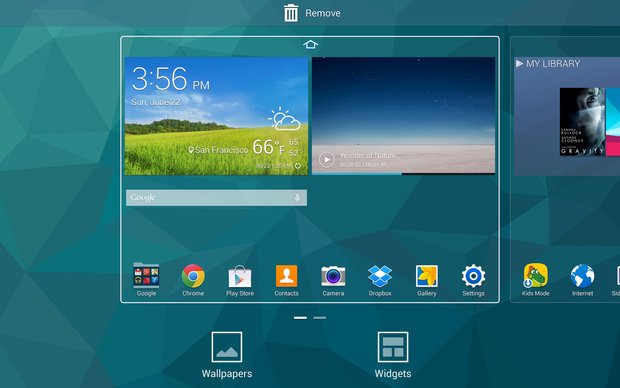 When in use, an image of a phone with your Galaxy S5’s homescreen is displayed, and you can interact with it just as you would if it was in your hand. They onscreen keyboard even adjusts for more typing room. While SideSync seems like an app you wouldn't use very often, it’s still incredibly cool and works quite well. The full features are limited to the Galaxy S5, but call forwarding works with the Note 3 and GS4, too. If you're married to Samsung's ecosystem of products, it's definitely a neat feature. Multi-Window has been available on a good number of Samsung’s phones and tablets, so it comes as no surprise that it’s now available on the Tab S. As the name implies, Multi-Window allows you to run two apps at once, side by side. 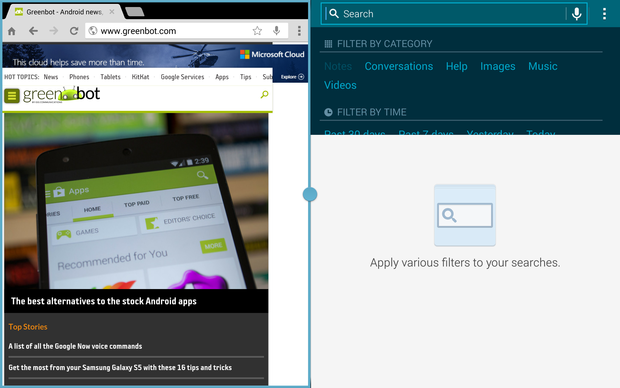 The feature is limited to only a handful of apps, but it’s easy enough to watch a movie in one window and cruise through the Google Play Store in another. If there’s a combination of apps you like to have open together, they can be saved as a group so you can open them together more quickly. The Exynos 5 Octa processor powering the Tab S provides a snappy and fluid experience, though it’s been known to be a bit of a battery hog at times. Luckily, even with the insanely bright display on these tablets, the battery sipped power gracefully when I was using them. After about four hours of heavy use on the 8.4 inch Tab S, the 4,900 mAh battery had only gone down to 84 percent with the screen brightness cranked all the way up—an impressive performance. My usage included watching a handful of YouTube videos, surfing the web, and playing far, far too much Dragons: Rise of Berk, which looks amazing on this screen, I might add. Streaming HD video had an obvious impact on battery life, but nothing dramatically different from the competition. Our lab is currently putting the batteries of both Tab S versions through their paces, and we'll add official test numbers to this review soon. 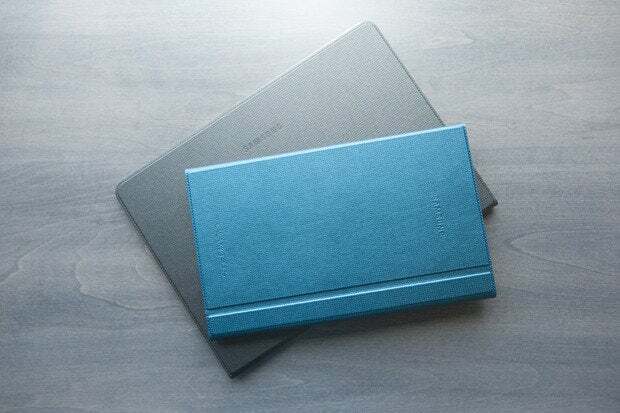 Samsung is offering two different covers that snap into the two holes on the back of the Tab S. It's a little difficult to put the covers on; you need to use a fair amount of pressure to secure them. Still, it’s an interesting method for attaching accessories, and ensures a solid connection. One accessory option is the Book Cover, which can be adjusted to three different viewing angles to provide the best option for watching movies, reading, or typing. The other option is the Simple Cover, which snaps onto the tablet and “simply” covers the screen. While it doesn’t provide a platform for watching movies or typing, it keeps the tablet slim, with little bulk. I didn’t get a chance to test it out, but Samsung will also offer a snap-on Bluetooth keyboard for the Tab S at a later date.